Users’ behaviors in social media systems are generally influenced by intrinsic interest as well as the temporal context (e.g., the public’s attention at that time). 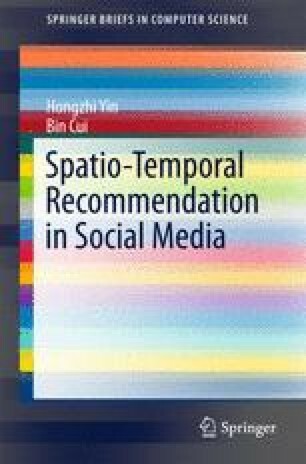 In this chapter, we focus on analyzing user behaviors in social media systems and designing a latent class statistical mixture model, named temporal context-aware mixture model (TCAM), to account for the intentions and preferences behind user behaviors. TCAM simultaneously models the topics related to users’ intrinsic interests and the topics related to temporal context, and then combines the influences from the two factors to model user behaviors in a unified way. To further improve the performance of TCAM, an item-weighting scheme is proposed to enable TCAM to favor items that better represent topics related to user interests and topics related to temporal context, respectively. Extensive experiments have been conducted to evaluate the performance of TCAM on four real-world datasets crawled from different social media sites. The experimental results demonstrate the superiority of the TCAM models.